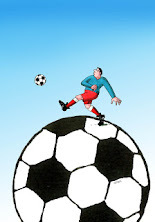 a) The World Press Cartoon can be regarded as the benchmark of quality and prestige for all those involved in the world of the humor graphic cartoon in print. It will cover three main areas: editorial cartoon, caricature and gag cartoon. b) The World Press Cartoon will not be a thematic event. Its objectives will be to distinguish the best-produced and published works in 2007.
c) In the category CARICATURE, only caricature works in a restricted sense will be considered, i.e. exclusively those of a humorous nature. d) In the category GAG CARTOON will be considered works that do not feature subjects dealing with current issues. e) In the category EDITORIAL CARTOON all entries must deal with actual contemporary events or personalities. f) The authors are totally free to submit what they consider to be their best work, although, it is obvious that those characters, themes and events of a more universal nature will be better suited for an international competition as the World Press Cartoon. The Prize-giving Gala and the Exhibition of the selected works will take place in the Spring of 2008 at the following venues: Sintra Museu de Arte Moderna and Centro Cultural Olga Cadaval, both in Sintra. a) Only the originals of the works will be accepted. b) Top quality prints of works achieved by digital tools will be considered originals as long as the author signs them. These will also require, in attachment, a description of the techniques and software used. c) The format of the works cannot exceed the European standard measurement A3: 420 x 297 mm. d) Each cartoonist can submit 1 original for each of the 3 different categories: editorial cartoon, caricature and gag cartoon. e) It is an essential pre-requisite for eligibility that the original works were published between Jan. 1 and Dec. 31, 2007 in newspapers or magazines, published on a regular basis and on sale to the public. f) To make proof of the previous condition, each original work must be accompanied with the corresponding printed page, in which the date and the title of the publication must be clearly visible. g) The author must also attach the header of the newspaper or magazine where the works were published, making sure that both the size and quality will allow for its reproduction. h) In such cases as the original work supports a title or a caption, a translation in English is obligatory, to be clearly written on the corresponding identification label. i) The works should be received by the organization's secretariat in Lisbon by Jan. 31, 2008. Secretariat Ana Ferreira. Original works must be posted in flat packaging, between two hard boards. Each of the works for submission must carry an entry form and identification label, clearly filled in, and attached to the reverse side of the original. a) The Jury of five members will be presided by the Salon director. b) The Jury will convene in order to examine all the entries and then will deliberate and decide on the prizewinners and runners-up. The Jury will also choose which of the original works will go into the exhibition and the catalogue. c) The decisions of the Jury will be taken by majority vote and will be final. a) The authors may choose to sell their works at the exhibition. b) If an author wishes to sell his/her work(s), this should be clearly marked on the entry form and identification label, together with the intended price in euros. c) The organization of the World Press Cartoon will add a gallery's fee to the author's original price. d) The digital works will not be for sale. a) All the works, which comply with the eligibility items, will be returned to their authors, independently of having been chosen or not for the exhibition, with the exception of those sold or prizewinners. b) However, the works chosen for the exhibition could also be selected to participate in other exhibitions and, consequently, returned to their authors at a later stage. a) All the participants with selected works will receive a copy of the catalogue. b) The Editors of the newspapers and magazines where the selected works were published will also receive a copy of the catalogue. a) The submission of a completed entry form and identification label will automatically imply the waiving of the author's royalties vis-a-vis the non-commercial reproduction of his/her work. b) The awarding of a prize to a specific work will automatically imply the waiving of its author's royalties to the organisation of the World Press Cartoon. b) Chosen from all the entries in the competition, the World Press Cartoon will award the best work with the Grand Prix of 20 000 euros. c) The Grand Prix winning work will be chosen from the three first-prise winners in each category. d) The author of the Grand Prix winning work will receive exclusively this prize, i.e. it will not be added to the first prize. e) The value of the prizes refer to gross amounts only and, consequently, will be liable to conform to Portuguese law. f) In accordance with the quality of the works for evaluation, the members of the Jury reserve the right to award or not all the prizes. g) All the prizes will be authenticated with a diploma and the winners will receive a trophy. h) Commemorative diplomas will also be issued to the newspapers and magazines that published the prizewinning works. i) The prizewinning works will become property of the World Press Cartoon organisation. j) The members of the Jury may also consider awarding additional runners-up status to some works. These will receive a corresponding diploma. k) All the authors with selected works both in the exhibition as well as in the catalogue will receive certificates of participation in the World Press Cartoon. The "Byzant" - Visual Art Center is organizing the 9th Annual international Comic art exhibition to be held in Prilep, Macedonia. 1. Participation is open to all artists of comics that currently publish or have published in national or international mass media and not published. 2. Participation will consist of an entry on the topic: "INTEGRATION". The format can be 21 x 29,7 cm - A4 Gallery format. Send only good laser copy. Each works must bear the signature or initials of the artist at the front, with name, surname, address, telephone number and e-mail address indicated on the back. 3. The entries should be packaged to protect the contents. The organization recommends placing the entry between two pieces of cardboard. Shipping will be paid by the participant. On packaged sign: "PRINT OUT OF VALUE". The organization is not responsible for any damage caused during shipment. 5. The entries selected by the Committee will be displayed in the 9th annual international exhibition of comic Arts. 6. The entries become part of the "Byzant" - visual art center archive. The entries may be displayed in all the premises of the "Vizant" - Visual Art center in itinerant exhibitions, and in publications that are periodically published. 7. The "Vizant" - Visual Art center has the right to reproduce and circulate the entries, whenever the author's name appears and the main objective is the dissemination of the exhibition or the participation in other activities of the "Vizant" - Art center general in area of art comix, that is to say, catalogues, posters, the press, web pages, etc… without generating any obligation towards the participating authors. 8. The organization will communicate through its web page or by means of letter the name of the authors whose entry has been received as well as the names of the selected entries. The authors will be informed of accommodation conditions if they want attend the exhibition opening or any activities parallel to this event. 9. 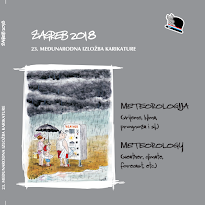 Once the exhibition has closed in Prilep, all the authors whose work has been selected will receive a copy of the publication made for the exhibition. 10. The organization reserves the right to not exibit those entries considered to be an affront to individual or collective rights. 11. Awards: Invited 5 artists on international comic art colony in Macedonia traveling expenses, visa, accommodation is a to ensure from organizateur. 12. Participation in the exhibition means the complete acceptance of all the above conditions. P. S."VIZANT" - ORGANIZATEUR IS A UNITED WHO PUBLISH CATALOGUE BOOK MIN. 160 PAGES AND AFTER EXHIBITION SEND BOOK TO ALL SELECTED ARTISTS PARTICIPANTS WITHOUT WHERE LIVING. The Organizing Committee of the 6th LM International Cartoon Contest invites cartoonists from all over the world to participate in this contest. Beautiful tableaus, lovely sculpting, humorous content and rich sentiment are the criterion of China LM International Cartoon Contest to award prize every year. A) Only original cartoons are accepted. Photographs, Copy, Computer painting, photocopies etc. will not be accepted. 7. JURY: The group of judges consists of the organizer, cartoonists, and art scholars. Participants are not allowed to raise any objections to judge determinations. B) We will send the medals, certificates and albums for all the winners before May 1st, 2008. C) The exhibition will be organized from January to October in 2008 in large cities of China for three times between two LM cartoon contests. A) The organizer can collect the works and put them into an album for publishing, exhibition. B) The entries can also be expressed in other publication. C) Artworks: will not be returned. Unite the collections to the LM Cartoon Museum. Participants are considered to have accepted all the conditions and are aware that their submissions may be reprinted and used without future monetary compensation. International Cartoon - and Comedy - Festival "Winterberger Winterspott"
The deadline for receipt of cartoons: 12th November 2007. – Analogue originals have to be submitted plane, unframed and unmounted. – Prints of digital artworks have to be numbered and dated in pencil on the front and pencil signed. – Not high-quality copies or ”digital originals” are not accepted! The cartoons must be the original work of the artist. If the jury should come to the conclusion that a work is conspicuously similar to the work of another artist, it will be disqualified and excluded from the competition. The name, address, telephone number, e-mail and web address of the artist have to be stated on the back of each cartoon. In case of entries via e-mail this information must be included in the mail. A short biography of the artist and a photograph (or self-caricature) shall be attached. The cartoons may not have been previously awarded of other contests. The cartoons may not have been previously published in books or catalogues. Normally entered works will not be returned. The return of original works is only possible at the author's explicit request at the time of entry in the competition. Therefore a self-addressed and prepaid envelope is necessary. Cartoons that got paid out prize money remain in possession of the publishing company and advertising agency ”ad medien GmbH”. 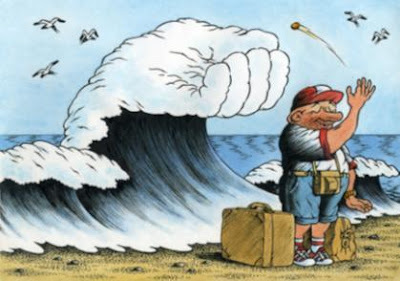 The European cartoon-contest ”Winterberger Winterspott” is endowed with prize money and material prizes, altogether amounting to 10.000,00 Euros. The German city of Winterberg and the publishing company "ad medien GmbH" from Wickede (Ruhr) in Germany announce for the first time an European cartoon-contest. Artists from all over Europe are challenged to explore the topic ”Alles im grünen Bereich” (winter sports and climate change). The jury’s awards will be made on 15th November 2007. The exhibition will open on 14th December 2007, 19.30 pm in the ”Kursaal” of the City of Winterberg. Selected works will be exhibited. 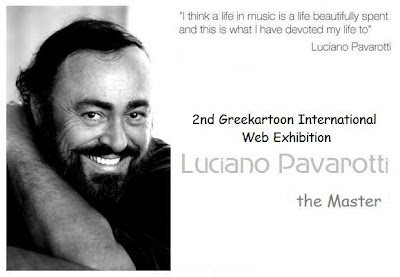 GREEKARTOON in further honouring "the master" Luciano Pavarotti, would like to announce an international web exhibition. Permanent Web Exhibition: Open to all artists worldwide, cartoonists, caricaturists, painters, illustrators, etc, etc. Technical Info: Any style, any technique, any size, any format, max 300 dpi will be accepted. Participators must send their works along with their biography and photo. All artists can participate through E-mail by submitting their works to: support@greekartoon.gr with subject "Luciano Pavarotti"
1st International Cartoon Contest “Molla Nasreddin”, Azerbaijan-2008. 1. The Contest is open to all professional and amateur cartoonists. 2. Subject “My Best Cartoon” is free. 3. 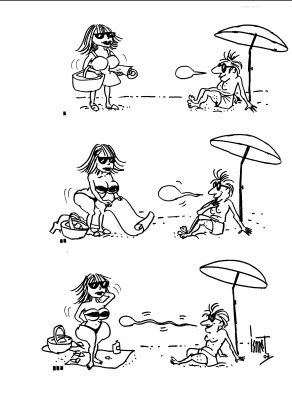 Cartoons that won places in other contests can also be sent. 4. Size of cartoons should be min A4, max A3. 5. Each cartoonist can submit a max of 3 works. 6. Deadline is March 1, 2008. 7. Cartoons must be original. Copies are not accepted. 8. On the back of each work the following information should appear: First name, surname, address, telephone number and e-mail, accompanied by the entry form and author’s short biography and photo. Otherwise, cartoons will not be accepted. 9. 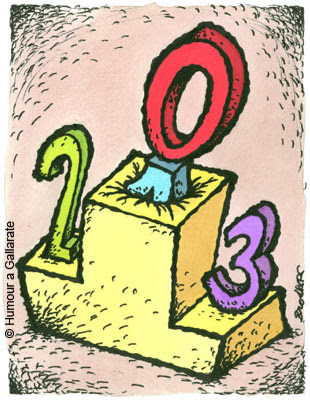 Cartoonists, whose works enter the catalogue of the contest, will be sent the one as a present. 10. The Azerbaijan Cartoonists’ Union is not responsible for damage that may occur during postage and handling. 11. The participating cartoons will not be returned. 12. 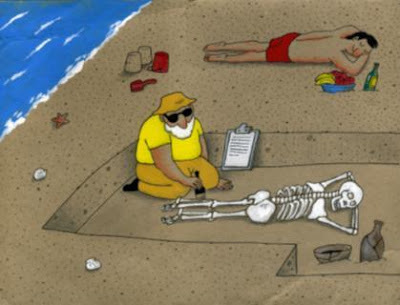 All the rights of cartoons sent to the Contest belong to Azerbaijan Cartoonists’ Union. 13. The Cartoons will be selected by the International jury. Special awards (20 persons) + diploma + catalogue. NOTA BENE 2008 Theme: Corruption! The Free Culture Partnership and the Nonconformist Art Museum continue the "NOTA BENE, OR PAY ATTENTION! PROJECT"
The project's goal is to raise awareness of social problems, which are cause for alarm in Russia and around the world. This goal is achieved by capitalizing on the creative power of artists from all around the world and organizing an international political poster and caricature competition. Selected entries will be shown in two exhibitions in St. Petersburg and Moscow and will be printed in special album made available to contest entrants, libraries, and non-governmental organizations. Top entries will be awarded prizes and artists will likely see their work used in awareness campaigns. The project started with the Danger: Nazism! exhibition which took place in St. Petersburg in 2005. A second exposition Danger: Femida! was held in St. Petersburg in 2007. The strong, positive response encouraged us to continue this successful project. The slogan for the latest international competition in the project’s framework: Danger: Corruption! 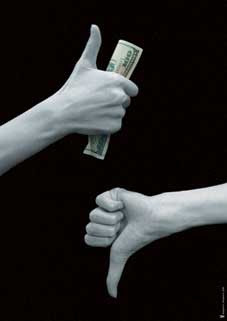 We chose this topic because we believe corruption is a problem that plagues the entire world. Police, bureaucrats, judges, and politicians can be bought on every continent on the world. We also believe that, in addition to fighting this problem with the help of judges and public opinion, it is also important to address this issue using the language of art. The jury will select the best works, which will be awarded with prizes and diplomas. Each participant will receive an album containing the works that were displayed at the exhibition. Additional copies of the album will be distributed to libraries and civic organizations across Russia free of charge. At the conclusion of the exhibition, all of the original works will become part of the Nonconformist Art Museum's permanent collection. In the future the museum and the "Nota Bene…" project, in accordance with the competition rules, retain the right to use the artwork for noncommercial purposes. We are sure that mankind will find the strength to fight and overcome corruption. 1. The jury will accept and evaluate two categories of work: posters and cartoons. 2. Entries need to be submitted by January 31, 2008. 3. The competition will be held at the Pushkinskaya 10 Art Center, 10 Pushkinskaya Ulitsa, St. Petersburg. - the Nonconformists Art Museum, St. Petersburg. 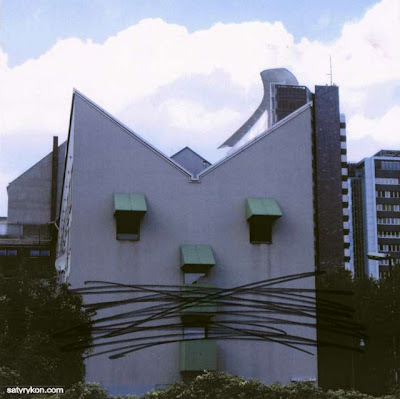 - the Andrei Sakharov Community Center, Moscow. 5. A press conference on the problem of corruption in Russia and a presentation of the catalog will take place in St. Petersburg. 6. The above-mentioned catalog will be distributed to all of the project's participants. 7. The jury will evaluate and award entries with prizes. The entries received the most online votes will also be awarded with prizes. The Viewers Choice Award (determined by online voting at http://www.notabene.org.ru/) – a 15,000-ruble prize (about $604.00). 8. After the closing of the exhibition, the original works will become part of the museum's permanent collection and the Nonconformist Art Museum and the "Nota Bene…" project retain the right to use the artwork for noncommercial purposes. 9. Submission size requirements: Posters must be A1 or A2 in size, while cartoons have no size restrictions. Participants who have difficulties sending their works in printed form are welcome to submit their art electronically on disc. Electronic submissions should be either in TIFF or JPEG format, and 300DPI. 10. Submitted works will not be returned. 11. By participating in this competition, the artist(s) agrees to these conditions. 1. The contest is open to all artists worldwide, cartoonists, caricaturists, painters, illustrators, etc, etc. III FACETIOUS VEDIO: Some funny and facetious things in the life. 4. (Plane works) The size of the works should be from A4(210×297 mm) to A3(297×420 mm). 5. Participators should summit the original works. Any slide, photograph or xerox will not be accepted. 6. First name, Last name, Address, Email, Telephone number should be written on the reverse. Accompanied by the author's entry-form and biography. 7. Technique and medium of works are unlimited. Traditional Chinese Painting, Oil painting, Print, Watercolor or Children’s painting are all acceptable. Black and white or in colors. (1) The length of the video should be limited within 20 minutes. No limitation on the video types. DV, FLASH, film editing or self-shooting by cell phones are all acceptable. The videos in the format of RM, AVI, WMV and SWF are accepted, which should be marked by the competitors. The language or text in the video can only be in Chinese or English. (2) Any of the commercial advertising, marks and any other external links are not accepted in the video except the name of the authors. The authors will be responsible for all the issues on copyrights which the works refers to such as music or other materials in the videos. (3) Please provide the information as below: the title of the video, size(in K&XY), introduction to the video (in 300 characters), author’s name, contact, email and address(including zip code), at least one piece of posters or captured pictures (in JPG, 120×90 px). (4) The authors can post the CD carved to the committee but we are not responsible for the possible damage during the posting process. 9. 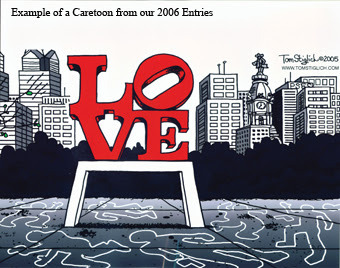 Deadline for entries is February 28, 2008. 10. The works must be original. The authors should have full copyright and be responsible for all the legal responsibilities related to the productions copyright. It is set for encouraging the cartoonists who are always thinking about the personalities, humanism and the future of human beings. 12. Some of accepted works will be printed in a brochure, on posters, in the world press or other printed matter for the purpose of publicizing the exhibition. In these cases, any fee for the use of works will not be paid. 14. Participation in the contest means the complete acceptance of all the above conditions and agreements with jury's decision. 15. Address: Zhu Cheng Room 2510, FLT & Research Press Building (5th Floor ), No.19 Xi San Huan Bei Road, Hai Dian District Beijing 100089, China 16. 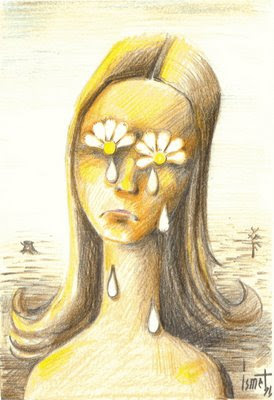 Under the auspices of Syrian Ministry of Information, Syria Cartoon website invites you to participate in 4th International cartoon contest (SYRIA 2008). Theme: Culture & Art – Media – Book – Cinema – Theater – Press – Cartoonists – Etc. 1 - Each cartoonist can submit a max of (6) original works (black & white or colored). Works made by computer will be accepted. 4 - On the back of each work the following information should appear: First name - surname - address - tel & fax - e-mail – theme section & title. 5 - The works will be displayed at Syria Cartoon website: http://www.syriacartoon.com/ or may be used for promotional purposes; cards, posters, newspapers, catalogs, books, websites, etc. Participants are considered to have accepted all the conditions and are aware that their submitted works may be reprinted and used without permission. 6 - All entry works must not be submitted as neither folded nor rolling form. 7 - The works will not be returned. 8 - All the cartoonists whose works will be selected for the exhibition will receive a catalogue & certificate. 9 - The jury will not reward the cartoons submitted to other festivals. The prize winners will be informed by mail. And the results will be declared on (March 2008). Grand Prize: 25000 sp & The Damascene Sword, Certificate, Album. Golden prize: statue, Certificate, Album. Silver prize: statue, Certificate, Album. Bronze prize: statue, Certificate, Album. 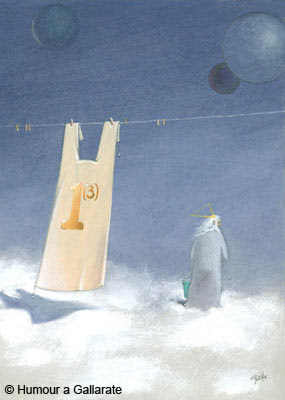 13 - By submitting the works, the author accepts the rules and regulations of the Contest and the decisions of the Jury. Yury Namestnikov, Russia - Special Prize. REGULATIONS 11th George Van Raemdonck cartooncontest 2008. 1. This cartooncontest is open to everybody. The participants are expected to acknowledge the regulations and commit themselves to accept its conditions and clauses as well as the jury's resolutions. Actions, persons and events must be depict in a humorous and artistic way without text or subtitles. There are no restrictions concerning colour or technique. 3. The drawings must be original and never before have been published or exhibited. There are no restrictions about the number of cartoons. The size of the drawings must be 21 x 30 cm (A4). Name, christian name and address must be written on the back of each drawing. Please write ont the package "Sample without Value" to save customs expenses. 1. xxxxxx eur: prize George Van Raemdonck, given by the village council of Boechout. 2. xxxxxx eur: prize of the cultural council of Boechout. 3. xxxxxx eur: prize Zeppo bvba for the best participant -25 year. 4. xxxxxx eur: prize Davidsfonds Boechout-Vremde for the best Flemish participant. 5. xxxxxx eur: prize International Humour in Art vzw. 6. xxxxxx eur: prize of the visitors of the exhibition(s). 7. 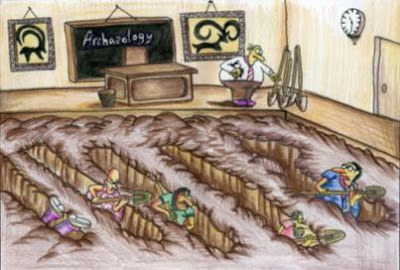 By taking part, all participants give the organizers the right to publish the cartoons in newspapers or magazines only for the purpose of promoting the contest. The participants give the organizers permission to show the selected works in a travelling exhibition. 8. The prize exhibits will become the property of the organizers. The selected participants will receive a free catalogue. Only on explicit request will remaining works be returned to the owners at the expenses of the organizers, who can not be held responsible for any loss of or damage to returned works. 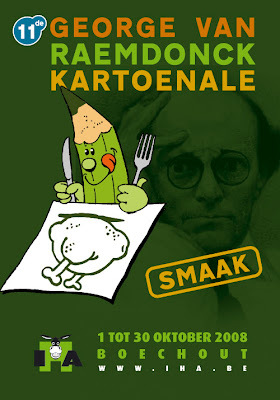 The organisers will transfer works, of which the sending back is not asked, to the European Cartoon Center in Kruishoutem to be part of its permanent collection. 9. INSURANCE AND SELLING CONDITIONS. All works are insured during the period of the exhibition(s). The works are insured for the value mentioned on the form of tender, if no value mentioned, the works will be insured at the value of 10 (ten) Euro. Exhibiting works, if wished by the participants, can be sold to interested parties. The selling price is equal to the stated insurance value, minus 20 % administration costs for the organizers. The purchased works can only be obtained at the end of the exhibition(s). Opening on Friday the 3rd of October 2008 at the village library, Jef Van Hoofplein 20, Boechout, Belgium. The exhibition is open to the public from Saturday October 4 till Saturday November 10, 2008, during the opening hours of the Library. 11. The jury selects the prize-winners and the cartoons for the exhibition. 12. Biographical data, in the possession of the organizers, will be exhibited in the exhibition hall. Add these data, shown on the form of tender, to your entry. 1.The competition is open to cartoonists from all nations. 2. 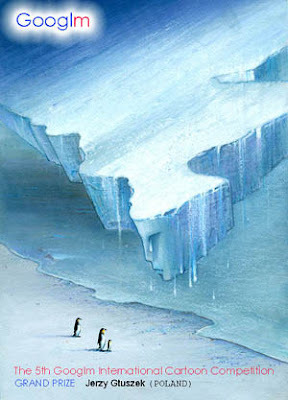 A first prize of £500, a second prize of £300 and a third prize of £200 will be awarded for the best cartoons, this year on the theme of climate change and other threats to the environment, under the title Earthworks 2008. 3. The jury, made up of leading cartoonists and well-known personalities, will be looking for clarity of message, cartooning skill and satirical humour (Jury members to be announced towards the end of 2007). 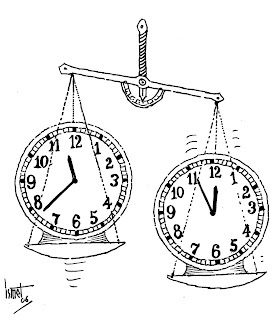 4.To qualify, cartoons can be submitted in electronic format (good resolution) or, preferably, as original works. Cartoons short listed for a prize and subsequent exhibition will be notified by the organisers, and their authors will receive honorary diplomas. 5. 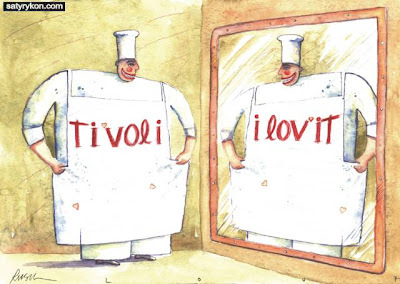 Cartoons with text and/or captions not in English should (if possible) be accompanied by a translation. It would also be useful to have some idea of the situation being addressed by the cartoon if it refers to a specific social or political event/situation which may not be universally understood. 6. Each entry must be signed by the artist and accompanied by an address and contact details. 7. Entries to reach the organisers by June 1st 2008. 8. The results of the competition will be announced on July 1st 2008. 9. An exhibition of the best of the submissions will be organised in London and the prize-winning cartoons will be published in the Morning Star newspaper and other journals. 10. Unless the submitting cartoonist stipulates otherwise, following the judging, the cartoons will become the copyright of the Ken Sprague Fund and the Fund will have the right to offer submitted cartoons for sale/exhibition and publication. Any proceeds from these, less a small commission and transfer fees, will be paid to the originating artist. 11. The organisers undertake to give due credit to the artists and ensure they receive any royalties/payments that may accrue as a result of the competition. 12. The first ten cartoons will be displayed on our website for a period of 12 months and later will become part of the page’s competition archive, accessible to visitors. 13. Artists submitting cartoons will automatically agree to abide by the above rules. 2007 CARETOON CONTEST - U.S.A. The National Liberty Museum's "Caretoon" contest puts a new spin on an old and respected art form. We invite you to create an original cartoon that expresses your personal ideas about caring and concern for others. The Theme for 2007 is "ANTI-VIOLENCE." All submissions should reflect this theme. A $1000 prize will be awarded in each category. THE WINNERS FOR 2006 HAVE BEEN ANNOUNCED! It is an original cartoon that reflects a positive theme. The theme for 2007 is Anti-Violence. The Caretoon Contest is open to anyone interested in participating. All ages and levels of artistic ability are invited to submit an entry(ies). Caretoons will be judged by a panel of professional cartoonists, educators, Museum staff and others. Entries will be judged on creativity, originality and message. All judges’ decisions are final. A $1000. prize will be awarded in each of the two categories. A Caretoon must be your original creation. Caretoons featuring copyrighted or pre-designed clip art or other images are not acceptable. You can create your Caretoon freehand or electronically. Caretoons may be created in black & white or in color. Caretoons must include a graphic; text is optional. Each Caretoon must be presented on a separate 8.5 x 11 sheet of paper. Caretoons may be any size provided they fit on an 8.5 x 11 sheet. There are no entry fees; no purchases of any kind are required. Print out and complete a Caretoon entry form from http://www.libertymuseum.org/. There is no limit to the number of Caretoons you may submit. Print your name on every Caretoon exactly how it appears on your entry form. If you are submitting your Caretooon(s) via email, attach your entry form and each Caretoon in jpeg format: must be 300 dpi; no larger than 8.5 x 11. Caretoons may be submitted by mail, in-person, or by email. Mail to: Caretoon Contest, National Liberty Museum, 321 Chestnut St., Philadelphia, PA 19106 U.S.A. In Person: Bring your Caretoon & Entry Form to the Museum. Hours are 10am-5pm, Tuesday –Sunday. The Museum is open 7-days a week during the summer months. You will receive FREE admission if you bring an original Caretoon. Note: Free admission does not apply to guided group tours. Caretoons will not be returned to their creator. The Museum reserves the right to display and/or publish any and all Caretoon entries. The creator will be credited for the work wherever his or her Caretoon appears. All entrants receive free membership to the National Liberty Museum and copies of any publication in which their Caretoon appears. One of the modern masters of Turkish cartoon, Ismet Lokman will exhibit his recent work at Istanbul Cartoon and Humour Museum, Turkey. 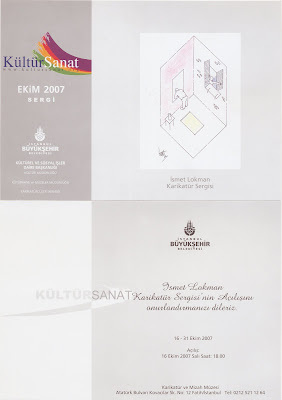 The opening ceremony will take place on Tuesday, Oct 16, 2007 at 18.00 local time and 40 originals by Lokman will be on exhibit. 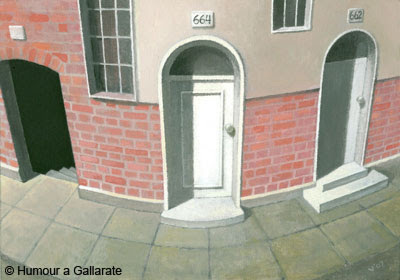 The cartoons all are selected by the artist from his work of 2006. The exhibition is on until Oct 31, 2007 at Istanbul Metropolitan Municipality Cartoon and Humour Museum, Ataturk Bulvari, Kovacilar Sk. No:12 Fatih / Istanbul / Turkey. Ismet Lokman was born in Bafra, Turkey, in 1938. He graduated from the Interior Architecture Department of the State Academy of Fine Arts, Istanbul. 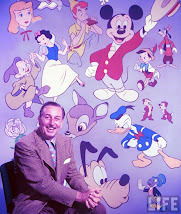 His cartoons and illustrations have appeared in many magazines and newspapers. Some of his international awards are: Simavi Cartoon Competition "Erol Simavi Special Prize" (1988), Honourable Mention (1989, 1990); International Nasreddin Hodja Cartoon Contest Grand Prize (1989), Honour Prize (1993); Knokke-Heist (Belgium) Honourable Mention (1991); Yomiuri Shimbun (Japan) Excellence Prize (1993) and Citation prizes. 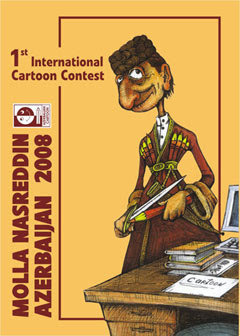 Once again the Grand Jury member in the 27th International Nasreddin Hodja Cartoon Contest this summer, he is planning to exhibit his most recent work of 2007 in Anatolia. A postcard from Lokman's archive (left below). 1. Theme: dietetic science: Health, delicious food, cooking, environment protection, epidemic prevention and so on.
. All the people who are interested in cartoon could take part in this competition, with no restriction of age, district and gender.
. Original works that have never been published on any kind of media before (including the internet). Plagiarist will be disqualified.No restriction on form and style. Both single piece and multi grid are ok (better no more than 4 grids). Both black and white works and colored ones are welcomed.
. Size: Letter submissions: A4 (21x29.7cm) is better. Each of the works must carry an identification label, clearly filled in, including name, address, phone number, e-mail and a brief curriculum. Digital submissions: resolution ratio: no less than 200dpi; the longest side: 1000pels; the quality of compression: 10 is the best. The title of the mail should be: To the Cartoon Competition about “Dietetic Science”. In the letter, clearly write: name, address, phone number, e-mail and a brief curriculum. All the submitting works will be exhibit on the competition pages of Okcomic.net. Every month, the period better works will be published on “Dietetic Science” magazine. Final judgment will be made by professional jury. Second prize: two, 500 RMB each with certificate. Third prize: three, 100 RMB each with certificate. 7. Copyright Statements: All the submitting works will not be returned to their authors. The organization has the right to publish all the submitting work both on internet and on paper. The proprietary right of the collected works belongs to the organization, while the authors have the right to sign their names. The selecting committee has the right to interpret all the items above. Addition: We'd like to communicate with cartoonists all over the world, providing the opportunity to publish your works in Chinese media, discovering and propagandizing the rising stars in the cartoon field and making friends with cartoon fans. We wish all of those who care about China cartoon industry worldwide could join us for the great days of cartoon field. 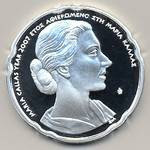 GREEKARTOON in further honouring the unique Maria Callas, would like to announce an international web exhibition. Participators must send their works along with their biography and photo. All artists can participate through E-mail by submitting their works to: support@greekartoon.gr with subject "Maria Callas"
1. The SATYRYKON 2008 International Exhibition is an open competition. 3. WORKS AWARDED IN OTHER COMPETITIONSwill be excluded from the competition. 4. The format of the works - maximum A3 (297 x 420 mm). Organisers are not responsible for transport damages. THE PARTICIPANTS ARE KINDLY ASKED NOT TO POST THE WORKS VIA ELECTRONIC MEANS AS THESE WILL NOT BE ACCEPTED FOR THE COMPETITION. 6. Participation in the competition is free of charge. However, the organiser reserve the right to include one of the submitted works in the Satyrykon Gallery. The work, chosen by the author, will in this way cover our costs of mailing (please use capitals). 7. Works should be accompanied by their author's photo or caricature, a short biographical note and a filled application card. 1. Works for the competition will be qualified by the International Jury. * the Legnica Culture Centre director's award for the youngest participant of the competition. The Jury has the right of final distribution of the statutory prizes, change of their amount, or non-awarding them or non-awarding the GRAND PRIX SATYRYKON. Jury's decisions are final. The competition results will be announced on March 1, 2008 at Satyrykon web site: http://www.satyrykon.com/. N o t e ! Awards are subject to taxation according to the current regulations. The condition to pay the authors is their arrival for the opening of the exhibition and collection of their awards by December 15, 2008, or indicating a bank account the money should be transferred to. 1. Authors of work qualified to the exhibition are given a presentation copy of the exhibition catalogue and a free-of-charge place in the catalogue. 2. The organisers provide the competition prize-winners with gratuitous participation in the SATYRYKON 2008 event on June 12-15, 2008. 3. Works sent to the exhibitions will be exhibited in the country and abroad after the main exhibition, and then will be returned to their authors by the end of 2009. 1. The organisers reserve the right to use the sent works for SATYRYKON advertising purposes without any special fees paid to the authors: to be exhibited and reproduced in a variety of advertising materials, as well as printed and circulated in catalogues. 2. The prize-winning works become the property of the organisers and will be included in the collection of the Satyrykon Gallery. 3. The exhibition organisers are the finial judges in interpretation of the regulations. 4. Sending his work the artist agrees to the mentioned above rules and regulations and agree to the publishing of the author's profile in the post-exhibition catalogue. (PL-59-220 Legnica, Chojnowska 2, tel. 0-048 76 852-23-44) e-mail: satyrykon@wp.pl. 3) Please send original drawings to this Festival. Black & white or colored, any style, any technique will be accepted. Digital artworks (CD&Disk) and good quality photocopies will be accepted. 4) Please write the following information in the top left corner on the back side of cartoon: name, address, tel & fax, e-mail, title & theme, sections. 5) Participants are requested to send together with their cartoons, an entry-form with signature, a photograph or caricature. 6) Titles or entry-form must be filled out in understandable English or Chinese. Format: JPEG, Size: max. 2000 k per cartoon, Resolution ratio: 200 dpi – 300 dpi. 1) Cartoon: Grand Prize (1 award), Gold Prize (2 awards), Silver Prize, Bronze Prize: Certificate + CD-Catalogue. 2) Caricature: Grand Prize (1 award), Gold Prize(2 awards), Silver Prize, Bronze Prize: Certificate + CD-Catalogue.